Marvel at some of Scotland's most stunning mountain scenery on this low level route into Loch Dochard and enjoy the peace and tranquility as you sit on the water's edge for a bite of lunch and drink in the views. Loch Dochard lurks in the shadow of a great ridge of craggy mountains. They dominate the view as you walk up the wide, flat valley from Victoria Bridge. Pick a fine day when the surrounding peaks rise up against a backdrop of clear blue sky, the sun picking out every detail of the stony summits and steep-sided coires. 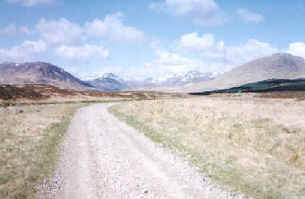 The route leaves the shores of Loch Tulla and follows track and path up the glen. At one point there's a rickety old suspension bridge to negotiate and, on the return leg, the forestry is currently low enough not to spoil fine views to Rannoch Moor. There's nothing too challenging to worry about. The outward leg is fairly flat with a solid track giving way to a grassy riverside path. Leave the car park by its exit on to the main road, turn left and head north along the A8005 - the shortest stretch of 'A' road in the country - to Victoria Bridge and, beyond it, Forest Lodge which sits at a wide junction. Turn left and follow the track signed 'Public footpath to Loch Etive by Glen Kinglass'. This right of way runs through a small woodland of Scots Pine before emerging into an open glen at a gate a short distance on. Stay on the track as it curves down towards the Abhainn Shira river. The track passes a tiny green hut which, believe it or not, once housed a small school. It is now used by a university mountaineering club and can apparently house as many as 20 people! Cross Allt Toaig on a flat wooden bridge and you arrives at a ladder stile and gate at the start of the next plantation. Don't enter the forest but fork left, following a green Scottish Rights of Way Society signpost marking the 'Public footpath to Loch Etive'. This runs along the river bank to the left of the fence. The path is fairly narrow but reasonably solid, although there are one or two boggy patches and a couple of small streams to cross. It meets up with a track below the farm at Clashgour. Cross the wooden footbridge over the Allt Ghabhar and continue along the flat riverbank to a rather dilapidated footbridge over the river. The wobbly wood and cable suspension bridge has seen better days and many of the planks are loose, which makes for an exciting crossing! Do take care not to end up in the swirling waters below. When you make it safely across, turn right and take the track up the glen to Loch Dochard. It's fairly rough and there's a bit of a climb but you soon emerge at a small wooden stable building above the water. The loch sits in a wide coire below a ridge of high hills, huge slabs of dark rocks protecting the steep peaks. Continue along the track a little way and a small bracken- covered promontory makes a fine place to stop for a picnic. If you were to follow the track on, it would eventually emerge at Taynuilt, passing through Glen Kinglass and taking in Loch Etive. But our route turns round here. Retrace steps back down to the wobbly bridge, admiring fine views down the glen as you go. There are impressive waterfalls to your left too. On the return you don't have to worry about crossing the suspension bridge. Head straight on along the track towards a stand of tall pine trees on the east side of the Allt Suilna Curra. Don't cross the stream here, but head up the right bank a little way to a narrow wooden footbridge. Cross and then climb over a ladder stile into the forestry beyond. Walk up the fence line a short distance to a firebreak on the left and let this guide you to an obvious track. The track passes through two high gates (which, if they are locked, you may have to climb over due to lack of stiles) and, a mile on, it reaches a T-junction. Turn right and climb up over the shoulder of the hill. The track curves round to a monument standing in the ruins of a croft called Druimliart, just beyond a low gate. The Gaelic poet Duncan Ban Macintyre was born here. From this point on, it's downhill all the way to the end. There's one more high gate to negotiate before the track emerges at the car park. If you're ready for a pint after all this, try the Inveroran Hotel which dates from 1707. Map OS Landranger 1:50,000 sheet 50. Start/parking Public car park near Victoria Bridge. This is reached by leaving the A85 at the Bridge of Orchy Hotel and following the A8005, a single track road (grid ref NN 271418). Grading Good track and path through open glen to remote loch, returning on forest road. Update The wooden footbridge over the Allt Ghabhar (grid ref 238421) has been washed away, as has the footbridge over the Allt Suilna Curra (grid ref 234415). Both can be crossed with relative ease when the water is low but could pose a problem when the water is running high. On a more positive note, the suspension bridge has been repaired.